Bottomline: Fantastic entry level controller with built-in LCD’s in the jog wheels. I must confess I was really excited about the Platinum when it came out. 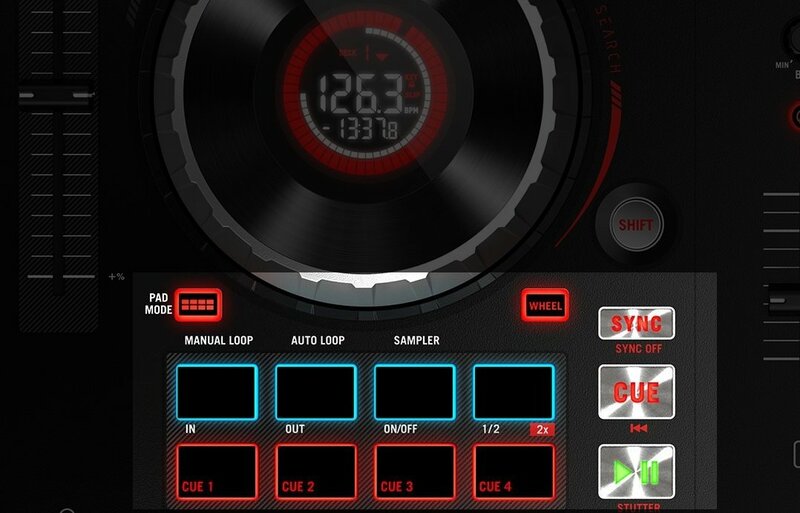 I already liked the Mixtrack Pro 3, but the added gain knobs and above all the LCD screens in the center of each jog wheel really spoke to me as a DJ. So when I opened the box, I was happy to find out that my excitement was justified. 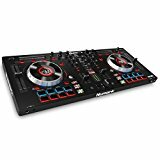 Granted, this is a budget DJ controller, so no metal faceplates or brushed aluminum or any of that fancy stuff. This is a plastic DJ controller, and although for some plastic might bring “toy” associations, this is not the case here. 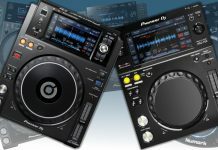 The Numark Mixtrack Platinum feels solid and is well build, the faders and knobs all feel well and behave accordingly. The pitch fader is excellent and well weighted to allow precise beat matching, the LCD screens are bright and contain the correct information.. All works as it should! Yes, the Mixtrack Platinum has jog wheels with built-in screens, and this a great thing. 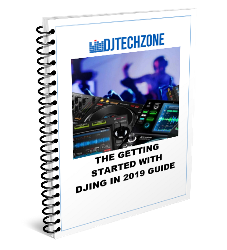 Visual feedback is becoming more and more important and in a time DJs have fully analyzed libraries of tracks it’s a waste not to use it to make life (and mixing) easier. Putting high-resolution touchscreens on a budget controller is not an option, so this solution is both elegant and costs saving. Great job Numark! 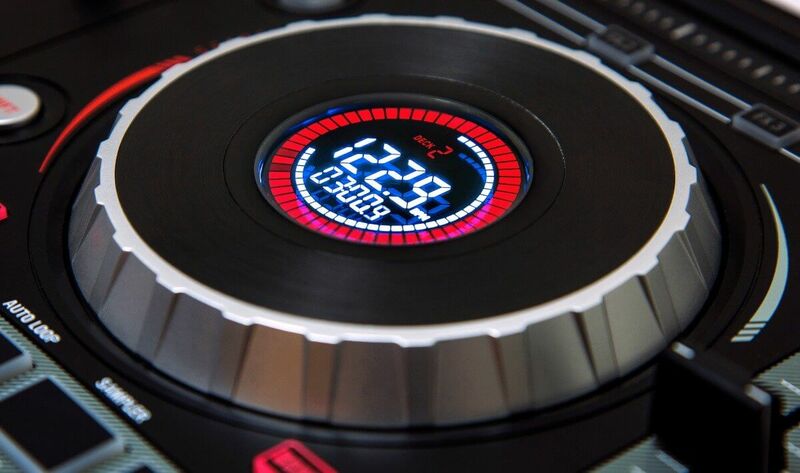 The screen shows quite a bit of data: track BPM, time left for the playing track, which deck is selected… There are 2 led rings, a red one that shows the needle position, and a second one that shows the time left to the end of the track. 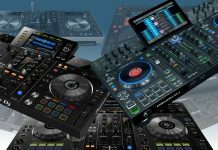 Great stuff and this will definitely help DJs to keep their eyes and focus on their performance instead of glaring at their computer screen. The pitch fader is not only the proper size, it also feels very smooth. Having the BPM displayed right on the jog really helps a lot as well (if you choose not to/can’t beat match manually) to adjust the BPM and prepare a mix. 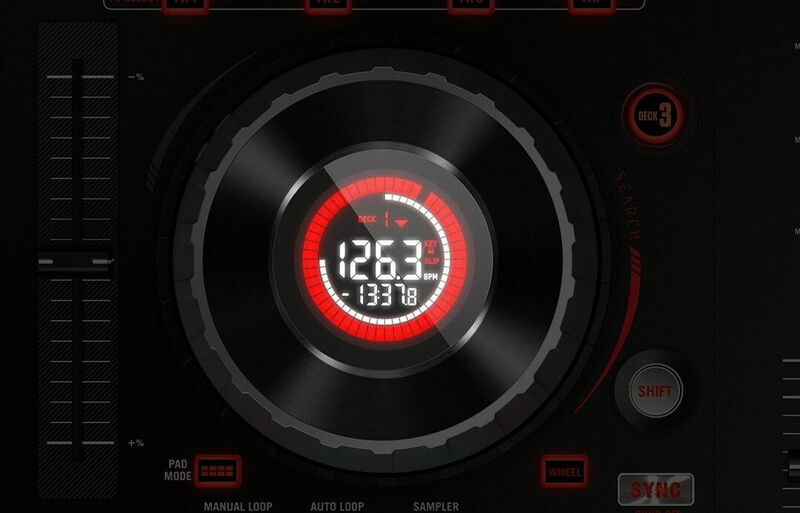 The combination of the screen in the jog wheel and the long throw pitch fader is really my favorite part of this DJ controller, and I expect something that will be used in future Numark (and InMusic) DJ Controllers. 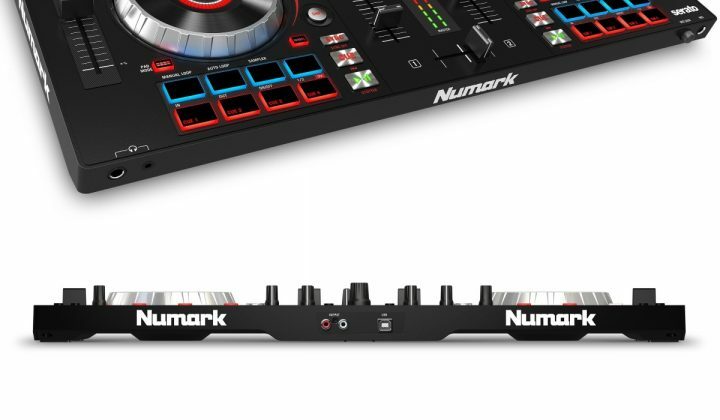 On the Numark Platinum, it’s possible to activate up to 3 effects at the same time, and there is touch strip to change the intensity of the effect. I found the touch strip to be a bit unresponsive, it needs quite a bit of pressure to react. Apart from that, it does work fine. Over the years, we have seen manufacturers get really creative as for how to activate and manipulate effects, but for me, the old school way (knobs & buttons) works fine and is, in my opinion, the most intuitive way of working. 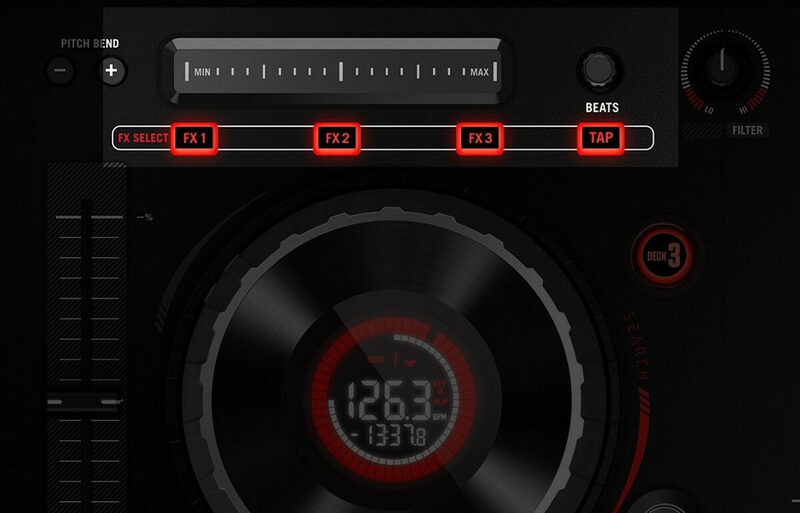 There is also a knob to select a number of beats the effects needs to work with. Although generally well laid out, I’m not a fan of the way the upper part of the performance pads is implemented. In order to set an operation mode the “pad mode” button needs to be pressed simultaneously to one of the upper pads. This allows setting the upper pad row in manual loop mode, auto loop mode, and sampler mode. Having a button on top of each pad column would have been a more user-friendly (yet slightly more expensive) solution. The bottom pad row gives access to 4 hot cues, and the sync, cue, and play/pause buttons are separated and stand out clearly. On to the mixer section. The Mixtrack Platinum’s mixer is a 2 channel software only mixer, and it has finally a gain control knob! The filter knobs are a bit oddly placed (on the left and the right top corners of the mixer) but work & sound very well. The mixer has a 3 band EQ and knobs to manage the master gain, the cue gain, and the cue mix. The rotary encoder to browse the library is big, but some form of illumination would be welcome to make it more visible. The inputs & outputs on the Mixtrack Platinum are not extensive, but all the basics are there: a double headphone jack and a microphone input with volume level on the front, and RCA output next to the USB input on the back. I like this controller quite a bit. No matter how digital DJing gets, having a decent pitch fader for beatmatching is crucial to me, especially if you are learning to DJ. The Mixtrack Platinum delivers one of the best pitch faders on an entry-level controller I have ever seen. Apart from this, the overall design of the controller is pleasant and all the functions and features are easy to use, with the exception (in my opinion) of the pad mode button and the touch strip for the effects. 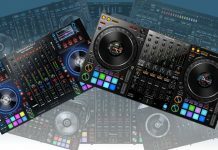 I strongly recommend this DJ controller to anyone starting out and certainly if you are planning to work with Serato DJ. 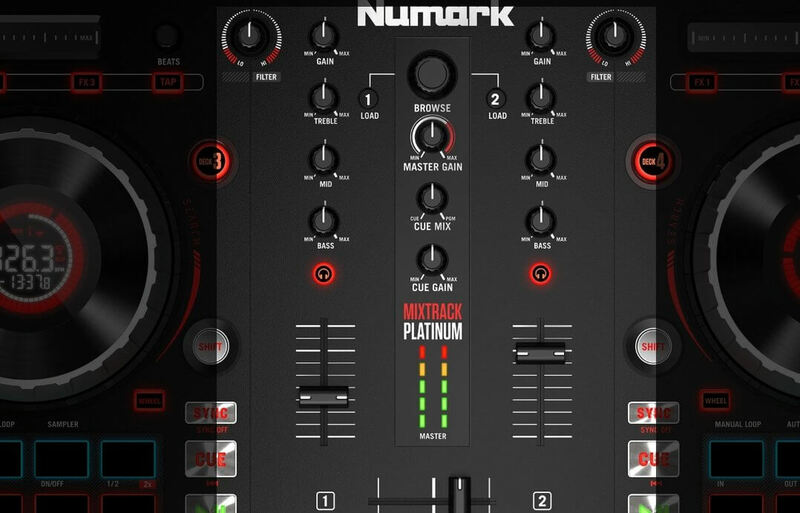 Compared to the competition, the Numark Mixtrack Platinum holds its ground. 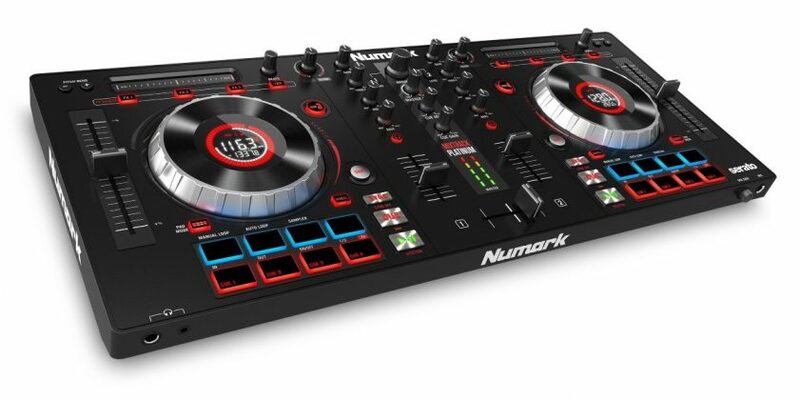 At USD 290, it is very reasonably priced, and a fine entry into the Numark DJ controller range. 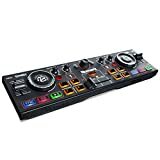 About the software: this controller comes with Serato DJ Intro, and while that is a workable piece of software, in my view it’s far too limited, even for beginning DJs. 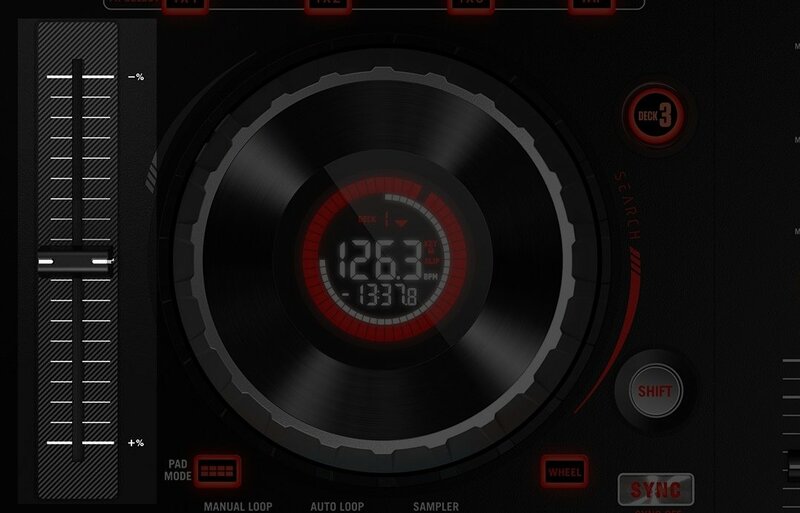 I strongly recommend to upgrade to Serato DJ and use that instead. At one point you will have to anyway, and by using Intro you will miss key features in Serato DJ that are simply not there.